The AIM NetworkNews and PoliticsTurnbull’s leadership a sham as he seeks to evade GBRF scandal, climate change with a dodgy NEG. Brilliant as usual. David Tyler nails it. Nobody else comes close. Turnbull in the headlights. Not a pretty sight. Another 8 months of this and we’ll be in the grip of an election campaign and chance to change the government. “What is beneficial to the Coalition is that voters understand we want to give prices priority over emissions,” Craig Kelly said. Don’t you just love it….”beneficial to the Coalition”. Forget what is best for the country, the planet, the farmers in drought and the dying reef. I really object to morons having such a loud public voice. ” Luce and I are in the sheep and cattle business in the Upper Hunter”. Doesn’t he realise how patronising that sounds? The optimal solution for the question of MDB water described in Karen Middleton’s fine article in “The Saturday Paper” is 24/7/365 monitoring of water extraction using satellite linked monitoring secure devices giving immediate feedback to the government inspectors. The devices must be maintained in proper order by the landholder on pain of penalties of no water extraction during the cotton boll filling period. The resulting inspectors must confirm alleged water use every month. Agriculture down stream from NW NSW is dealing with broad acre farmers who previously believed that turning off the sprays on crop-dusters over-flying townships was too arduous … until a local townsperson advised that they would “fix up the weeds” by aerial spraying their town plot and “forgetting” to turn off the sprays as he flew over the adjacent boll-filling cotton crop. Now all crop dusters are fitted with GPS trackers to identify the cowboys who spray towns. Too much, as usual David!! But thank you for identifying the entities of the present mess that the LNP misgovernment have encouraged to happen by their ineptitude!! There was an item on local ABC radio here in Far North Queensland this morning. The sugar cane harvest is in full swing but due to very low world prices for sugar, many growers are considering not harvesting their cane or if they do they will likely lose money. The suggestion is that this sugar cane ( bagasse and molasses) be taken out west to drought areas to provide a nutritious feed for starving stock and that the government should be considering subsidising this rather than the family home allowance. seems to make sense in times of extreme measures !! Mal, our man from the Snowy River, our very own promoter of Drizabone and RM Williams, Acubra hats and strong silent hugs….. I should not laugh, as I too did a spot of ‘farming’ ; my gear eagerly waiting for me even before the ‘farm'( farmette) purchase had gone through…. It is being kept secret that Lucy Turnbull is Patron of The Great Barrier Reef Foundation. BOM has suggested that there is a 50% chance of an El Nino later in year, while NOAA suggests there is a 70% chance. The question is what further contingencies have the LNP in place to provide assistance should the drought last longer. 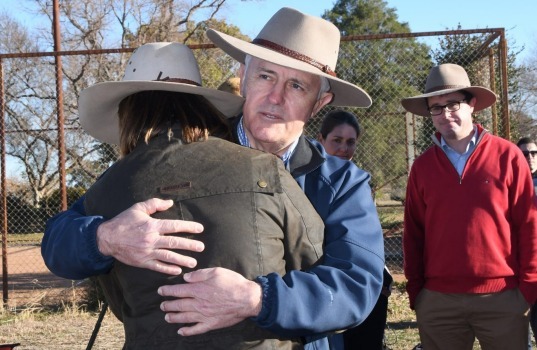 Damn those stiff hats, they come in the way when attempting a proper Oz country hug…. Thank you David Tyler, a brilliant indictment of this truly awful, useless, sham PM. I can’t wait for the elections to be rid of this fool and his face. Surely the Australian Rain Corporation which our fantastic leader big Mal invested a cool $10mil dollars into a few years back can end this drought. None, I think would be the answer there – or – blame Labour! David – a brilliant, if depressing piece of work, as usual! It reads like satire, but, unfortunately, it’s the state of the nation! Yeah, A rain corporation that can’t make it rain and governments who vote to keep global warming at 1.5 degrees centigrade to save the world. What a bunch of morons. Are our politicians really that profoundly stupid that they can’t see what they are doing and what’s coming. Are the brain dead morons driven purely by greed so blinkered and so blind that they will destroy the planet for a buck? Because that’s what they are doing – Putting money ahead of common sense. A Mesiah won’t save us – He is only here to guide us. What we need is someone with at least half a brain to step up, get focused, and point the way to a sustainable future with the best interest of every Australian at heart. That will not be someone driven by money, power and greed. It is not, and will never be, Malcolm Turnbull. With the Turnbull government opposing a banking royal commission, opposing a national ICAC, intending to hand corporates $80 billion in tax cuts, flooding the workforce with unskilled immigrant labour, Turnbull’s $444 million unsolicited handout to his cronies, Australia being corrupted by the Turnbull government and Turnbull’s tax evasion. You can smell the stench of betrayal in the air. With all good intent we vote our representatives into power and then they are “engaged” by corporates and the financial elite. Well, Turnbull was already engaged and, we didn’t vote for him to be Australia’s prime minister, he was placed. He was placed by the top end of town to do their bidding and, that’s what he does. A leader driven purely by money, power and greed. Sounds a bit third-world and selfish doesn’t it and, not realy what we want, if the objective is to save all of us. Kafka-esque…. even Salvador Dali would be bemused by the antics of these Ruling Rabble incompetents. Jaquix – it makes me so angry that we have to wait another 8 months, think of the damage they can cause in that time? The corruption involved in this GBRF thing should be enough to bring them down NOW – or at least enough to bring Turnbull and Freidenberg down. If we had decent MSM in this country, the wolves would be howling for blood. I will do my share and spread the word, David Tyler. The Federal LNP are really the most degenerate mob I have ever seen. Labor will win the next election – well in a slightly more sane universe, but anything can happen, such as a Brexit or Trump. My question is how much can Labor revitalise, repair, restore and finally, improve before the inevitable swing back to this mad mob of Libs and Nats? Gonna take a long time before any real progress can be made for our wide brown land. Much less important than immediate action on climate change, however, significant given the exceedingly limited representation federal provides all Australians, is the symbiotic relationship between the Christian religion and our political system. I would like to remind AIM readers, Phillip Ruddock, of the ageing white male league of Christians, is about to announce the results of the tax-payer funded “Freedom of Religion” review. The infiltration and selective use of religious mythology reinforces the mad and bad federal government – besides all this religious guff only encourages the bastards. The National Secular Lobby will be reviewing the FoR review when it is released and would appreciate public input. They are also lobbying for the removal of another anachronism, Christian prayer before opening of parliamentary debate. In late June 2018, NSW Greens senator, Lee Rhiannon tabled a motion to replace the prayers traditionally read in the senate at the start of each day with a more religiously diverse and non-discriminatory statement. Could Labor members please restrain their abhorrence of the Greens, just this once, and support Ms Rhiannon and the NSL campaign? Senators, let us, in silence, pray or reflect upon our responsibilities to all people of Australia, and to future generations. Of course, this only addresses religious bias in the senate, what to do about the Lower House remains a challenge. Diane – There is something we can do – The Australian public are kept in the dark by big business main-stream media because, they only tell us what’s best for them and the political party they support. Sending a wake-up call to politicians, and the top end of town, doesn’t work. If it’s not about money and power-play, it’s outside the realm of their comprehension. It’s like banging your head against a telegraph pole in Morse code. The only way to achieve social change is to wake up the people – Wake-up Australia! That can be achieved by getting more people to engage with independent media, honest social media and word of mouth. Email your family and friends and tell them. Get them to tell all their friends and so on and so forth. It’s a battle because people only hear what they are ready to hear. But, the seeds must be planted and each one of us can have a part to play. Back-up what you say with evidence and cold hard facts. If the hundred monkeys principal kicks in, people will walk outside stretching, yawning, rubbing their eyes and looking up at the sky. Every precious one of us and, that beautiful colour blue is worth protecting. To do that we need to sideline those who would destroy us and our planet for a handful of dollars. Check the credentials and integrity of those you vote for and hold them to a bigger vision that includes our grandchildren. Yes Diane, 8 months too long. But what will an election do in terms of curing the body-politic of that corrupted thing we call the 4th Estate? MSM is a plague on progress, they do not care about the public. We can vote out the LNP but their MSM propaganda department will remain intact and continue its fight to destroy any real chance of democracy or having any rational debates. The LNP has a glaring weakness, ie the GBRF shemozzle. Labor and the Unions are unlikely to get a better target before the next election. Unions in particular can promote idea of how corrupt is the deal and how corrosive it is. If the Great Barrier Reef Authority can get thrown under a bus, no govt dept/authority is safe. David, said it before will say it again, Malcolm Turnbull is today what he was yesterday and will be tomorrow, “you can out distance that which is running after you but not what is running inside you”, Rwandan proverb. An opportunist with a malleable ego, no idea about any idea and even incapable of “..stealing/plagiarising…” (his phrase) one effectively. He has this incredible talent, agility and ability, evidenced without exception, by his illustrious career, to spot and opportunistic gig embark demand stewardship scoop up his booty than disembark just before he drives it over the cliff. Also, Turnbull have/has this incredible talent to string absolutely meaningless sentences/words that sounds impressive (operative word sound) with no digestion or analysis by MSM just dialysis to suit their newly anointed messiah MK11, suppose their MK1 Tony Abbott was a bit of a let down. It’s a bit much to the point of nauseating, to watch and hear how MSM now deny/run from their creation messiah MK1, who can forget all in pentecostal rapture all at behest of the media tsar and corporate union “… Australia needs Tony Abbott …” or “….price on carbon to cost jobs…sovereign risk….” etc etc. have they no shame. If only MSM did due diligence on Turnbull, as they did with Gillard, they would have realised Turnbull is today what he was yesterday and will be tomorrow, but than again just because he can string absolute meaningless sentences/words together he always was and be one of them, the sanctified breed, from the rarefied oxygen tent CPG, they will/were and continue to be hell bent on their halo of him, hoping the masses would forget their rapturous braying for messiah MK1 Tony Abbott. Wonderful, wonderful stuff analysing issues avoided by media and press alike like the plague. David Tyler, your blood should be bottled. and you fast forward to @ precise 15.04 billies outback adventure. Hypothetically, I can assume that Malcolm can read the writing on the wall “27 Newspolls”, with the possibility that he may need to find “something else” to occupy his time. His generous gift to his GBF mates may encourage them to include him in the game.